Join certified Acro Yoga instructor, Samitha Hendrickson, for the FUNdamentals of dynamic partnering and acrobatic balancing that is Acro Yoga. A practice that blends elements of yoga, acrobatics and thai massage. You will learn to balance someone else’s body on your feet – called “basing” – to be balanced by someone else – called “flying” – and to spot. This practice plays with elements of control and letting go gracefully in coordination with someone else. No previous experience or partner is required to attend, just bring a basic level of body awareness and a willingness to try new things. You will be amazed with what you can do! Individual sign-ups are encouraged. We’ll find a partner for you! Climbing, games, competitions, prizes, FREE BEER!, and social time with friends (old and new), it doesn’t get much better than this! The FIRST TUESDAY of every month, we invite you to be part of the Edgeworks community: meet other climbers, share stories, get tips from our staff, and have fun. These events are also an opportunity for us to support the awesome work of our friends over at the American Alpine Club and Access Fund by providing discounted day passes to the members of either group. If you’re not already familiar with the work these two organizations do to keep outdoor climbing areas open and conserve the climbing environment we all enjoy, we invite you check them out and get involved. As always, our Climbers’ Social evenings are FREE! for Edgeworks members. • $18 for everyone else. Discounted day passes available after 6pm; social and activities begin at 7pm. Who will be crowned the king/queen of Add-On 2019? If you’re participating in the Member Challenge, you may be familiar with this fun training game that helps develop route-finding skills, memorizing sequences, endurance and working on weaknesses (especially when playing with someone who climbs differently than you). The first climber does the predetermined sequence, adding one “move,” typically defined as one hand movement with set footholds (foot movements are not considered stand-alone moves). The next climber repeats the new sequence and adds on a move of their own. And so on, until 1 climber cannot perform the previously added sequence. Because competitions aren’t just for boulderers! 1) Find a partner. 2) Compete: male/female; beginner, intermediate and advanced categories; members only. 3) WIN prizes!! Put your membership to good use and receive a FREE t-shirt with our 4th annual members only 90-day challenge! Earn points by completing a list of challenges including over 100 different activities – from climbing, fitness and check-in challenges to attending socials, interacting with staff, fun games, hula hooping and more. As points are achieved, 3 different levels of “peaks” are awarded and added to your FREE member challenge t-shirt. It takes 175 points to earn all 3 peaks; with over 300 points available! New challenges are added every year including fitness, climbing games and skills based challenges with a distribution of points designed to engage both the over and under achievers among us. As proven in previous years, it is possible to earn all 3 peaks in one day (IAD) but there are also plenty of really fun challenges that are accessible to all skill levels and will keep you coming back for more points and peaks! Get a sneak peek at the 2019 Challenge List and start planning your strategies now. Points will be tallied once a week by Edgeworks staff and T-shirts will be distributed upon achievement of the first peak (65 points). T-shirts will be labelled with the member’s name and added to a rolling cart to be located near the front desk. *Current stock/availability may delay the delivery a t-shirt by 1-2 weeks. Note: Feel free to wear and wash your shirt during the challenge but please refrain from using fabric softener until after all of your peaks have been added. Iron-on peaks will be made available at the front desk along with simple to follow DIY instructions. Or you can bring your shirt to the monthly Climbers Socials in March, April and May, when we’ll have staff available to add the peaks for you. Members are responsible for tracking their progress and checking the boxes on their challenge sheets as items are completed. To entice those of us with an extra competitive spirit, we will update a public Challenge Board with everyone’s individual points – you know, just in case you want to see how you match up to the achievements of others. The 3rd Tuesday of every month our experienced, professional, and certified Edgeworks staff will lead a different clinic – from movement to gear and training techniques. Schedules and topics will be posted monthly and online registrations will be made available in advance of each clinic. Registration is FREE for members but space is limited so be sure to SIGN-UP early to claim your spot and take advantage of this cool member perk! Space is limited. Sign up online to reserve your spot! Looking for a FUN and ACTIVE way to entertain the kids during Spring Break? Sign ’em up for Edgeworks’ Rock Climbing Camps! Rock climbing is a great way for kids to build confidence, while promoting creative thinking, problem solving, team building and trust. Not to mention that it’s a great way for them to burn off some of that extra energy during Spring Break! Our programs are designed to entertain and challenge kids no matter their skill level. From beginner to advanced, our professional staff will keep them engaged in fun climbing related activities and games. 2019 DATES: 1 Week ONLY! No experience necessary! | Sign up for 1 day or the whole week. 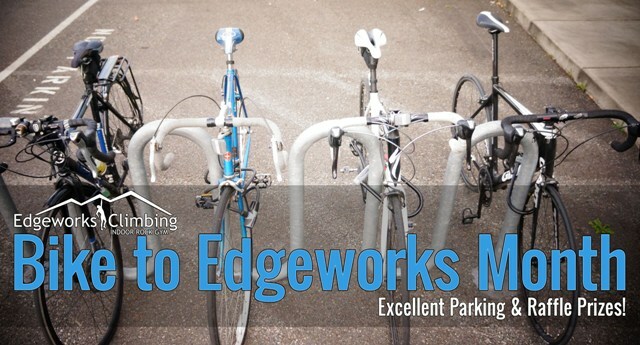 Edgeworks members receive a 10% discount!